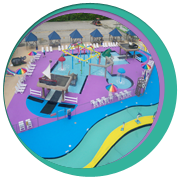 Adults and Teens can ride the 50 foot tall 210 foot long Double Turbo Twister Slide, take a plunge in our 2,000 square foot Swimming Pool or experience our 100,000 gallon Wave Pool. When you get tired of swimming, lay out on our sun deck and soak in the rays. While you are relaxing, the children can be enjoying our 5000 square foot interactive wading pool and wet deck, kiddie slides, bucket dumps and many other features that will hold their attention for the entire day. 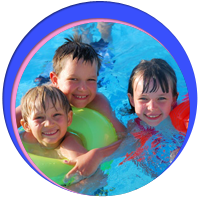 For your peace of mind, the Wading Pool area is completely fenced in and under full time lifeguard supervision. 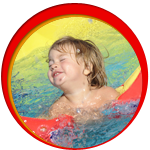 On the Splash deck you will find a Sinking Submarine and Frog Slide for the kids. And while you are out there and don’t feel like walking all the way back to the grille for a drink, jump over to the Tiki Bar that serves as a mini grille and gift shop. For a change of pace, take a relaxing float ride around the 600 ft Lazy River or spin around in our Bumper Boat Pool. When you work up an appetite, you can stop by the Ice Cream Shop for a complete variety of flavors, or if you are really hungry visit our Grille for anything from Nachos and Cheese to a Burger and fries. While enjoying your food, take a few minute to browse around our new Beach Wear Store, for towels, clothing, sunglasses, or anything you may need for a day at the water park. When you get tired of the water and feel the need for speed visit our Speed Park and ride our Indy-Karts on a concrete road course. There is always something to do at White Lake Water Park. 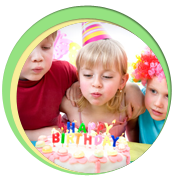 We have also added a second air conditioned Birthday Party Room, so don’t forget to book your party with us. We have added Picnic Areas adjacent to the water park, complete with picnic tables, and barbecue grille’s to be reserved for your family reunions or simply a meeting place for the entire family to gather and eat and relax during a hot day at White Lake Water Park.